Reducing SLCPs is critical for slowing down the rate of climate change over the next several decades and for protecting the people and regions most vulnerable to near-term climate impacts. Black carbon, tropospheric ozone, methane, and hydrofluorocarbons (HFCs) are all considered short-lived climate pollutants (SLCPs). Because these pollutants have atmospheric lifetimes of only days to a decade and a half (compared to CO2 which can persist in the atmosphere for millennia) they are referred to as short-lived climate pollutants. SLCPs account for 40-45% of global warming, making fast mitigation of these climate forcers, along with CO2 mitigation, essential to combatting climate change. Black carbon particles are emitted to the atmosphere through incomplete burning, from both natural sources (such as forest fires) and man-made sources (such as agricultural fires, domestic biomass burning, oil and gas flaring, and diesel combustion engines). Methane is powerful greenhouse gas with a 100-year global warming potential and 21 times that of CO2. Approximately 60% of methane is emitted to the atmosphere through human activities such as oil and gas systems, agriculture, landfills, wastewater treatment and emissions from coal mines. Tropospheric ozone is a secondary pollutant, not emitted directly but instead forms from reactions between precursor gases both human produced and natural including carbon monoxide, oxides of nitrogen (NOx) and volatile organic compounds (VOCs), which include methane. Hydrofluorocarbons (HFCs) are factory-made chemicals used primarily in air conditioning, refrigeration and insulating foams. HFCs are the fastest growing greenhouse gasses in much of the world, increasing at a rate of 10-15% per year. Cutting SLCPs can reduce the current rate of global warming by almost half, the rate of warming in the Arctic by two-thirds, avoiding up to 4.7 million premature deaths each year caused from outdoor air pollution and up to 1.6 million a year from indoor pollution. 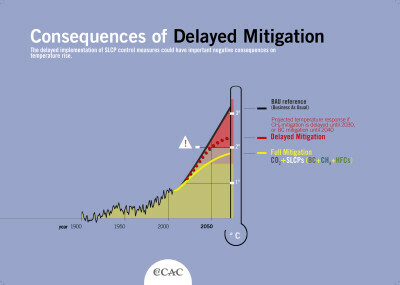 Reducing SLCPs can be achieved quickly and using existing technologies and institutions to reduce these non-CO2 climate pollutants may offer the best near-term protection for the countries that are most vulnerable to climate change impacts, including island nations, countries with low-lying coastal areas, and agriculture-dependent countries in Asia and Africa already suffering from droughts, floods, and shifting rainfall. Slowing the rate of climate change and reducing near-term impacts is a critical complement to adaptation strategies and to sustainable development, with the potential to provide global benefits for climate, crops and health valued at $5.9 trillion annually starting in 2030. Carbon dioxide (CO2) emissions are responsible for 55-60% of anthropogenic radiative forcing. Fast and aggressive CO2 mitigation is essential to combat the resulting climate change. But this is not enough. CO2 mitigation must be combined with fast and aggressive reductions of the pollutants causing the other 40-45% of forcing. These pollutants include black carbon, tropospheric ozone, methane, and hydrofluorocarbons (HFCs). 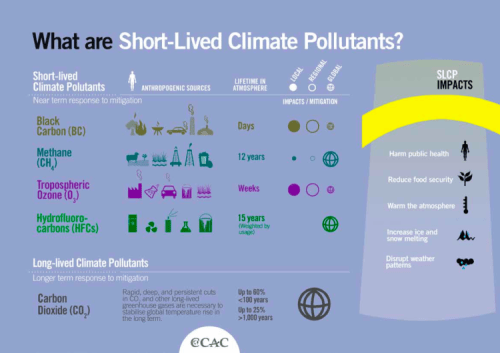 Because these pollutants have atmospheric lifetimes of only days to a decade and a half, they are referred to as short-lived climate pollutants (SLCPs). Some of the SLCPs have a particularly powerful impact in the regions where they are emitted. 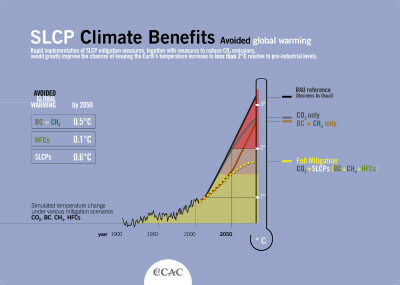 Reducing SLCPs is critical for slowing the rate of climate change over the next several decades and for protecting the people and regions most vulnerable to near-term climate impacts through the end of the century.